Many NBA sources speculate that LeBron James left Cleveland because teammate Delonte West had an affair with his mom, Gloria James. LeBron was allegedly furious when he found out about the hanky panky that went down at his own MVP party. West also left Cleveland this off season and signed with the Boston Celtics and will be suspended for the first 10 games of the season for a convicted weapons charge. … that still doesn’t answer the question, but sure does make things interesting! 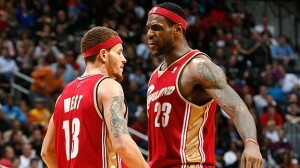 Posted in NBA and tagged Boston Celtics, Cleveland Cavaliers, Delonte West, LeBron, NBA. Bookmark the permalink.